Not due here until early September, the new GLC Coupé opens up more new ground for Mercedes-Benz, taking its place alongside the GLC – their first ever mid-range SUV in right-hand drive– whilst expanding the portfolio of models built on the C-Class platform - namely the C-Class saloon, estate, coupé, and cabriolet. Following a route already taken by the GLE Coupé, introduced as a sporty edition of the new GLE, the new CLC Coupé is to be a “niche model that will appeal to those seeking an even more sporty version of the GLC itself”, according to Ciaran Allen, sales manager for Mercedes-Benz passenger cars in Ireland. From reaction received from dealers, Allen expects it to capture the interest “of those who rate style just as highly as substance”. Just a few short centimetres longer and lower than the GLC, the new Coupé is strikingly similar to it in terms of its outer appearance, save for its sloping roofline, short rear overhang, and single-louvre grille with star inset and sparkling diamond-finished backing panel. A discreetly positioned rear underguard reflects its SUV heritage. Aerodynamically, the new Coupé leads its segment with a 0.31 Cd value. Also putting it amongst the best-in-class - whilst helping to restrict fuel consumption - is a body weight of just 1,710kg, made possible through an intelligent use of aluminium and a mix of high to ultra-high strength steels. Inside, passenger space is on a par with the GLC with entrance height, shoulder, elbow, and legroom all identical. Another segment-leading feature is its load compartment which is extendable from 491 to 1,400 litres. Though price, range, and specifications relating to models sold in Ireland have yet to be ‘locked and loaded’, it is likely that the new Coupé will launch with a price tag circa €60,000. The new Coupé will be manufactured by Mercedes-Benz in eight engine variants - four petrol and four diesels - all EU6 emissions standards compliant. 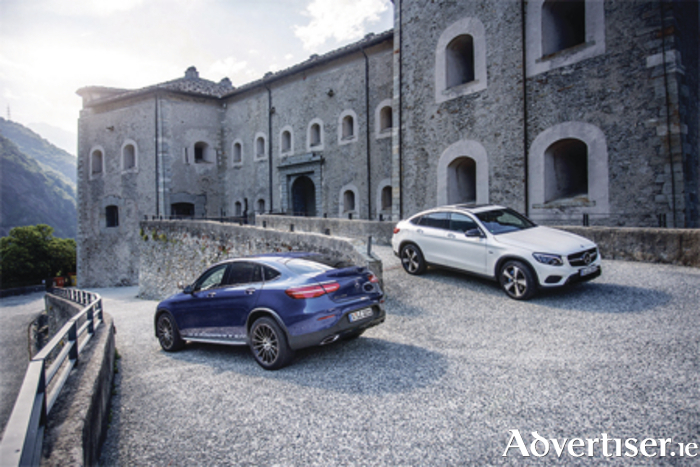 Of these, the GLC 200d Coupé and GLC 220d Coupé will be most suited to the Irish market. Nine-speed automatic transmission and sports suspension are standard across the range, while more direct sports steering provides what Mercedes-Benz says is “superior ride comfort and a decidedly sporty agility”. Permanent all-wheel drive is standard on the 220d. In terms of specifications, models sold here will come highly equipped with a wide range of standard items consistent with the policy now being pursued by Mercedes-Benz. Included will be all of the driver and passenger comforts and high-tech gizmos owners have come to expect in this class of vehicle. In addition, safety and driver assistance systems now common across the Mercedes-Benz range will form part of the standard offering, supplemented by a comprehensive selection of optional items. Contact one of the dedicated Mercedes-Benz sales team at Michael Moore Car Sales on (090 ) 6403000 for more details.